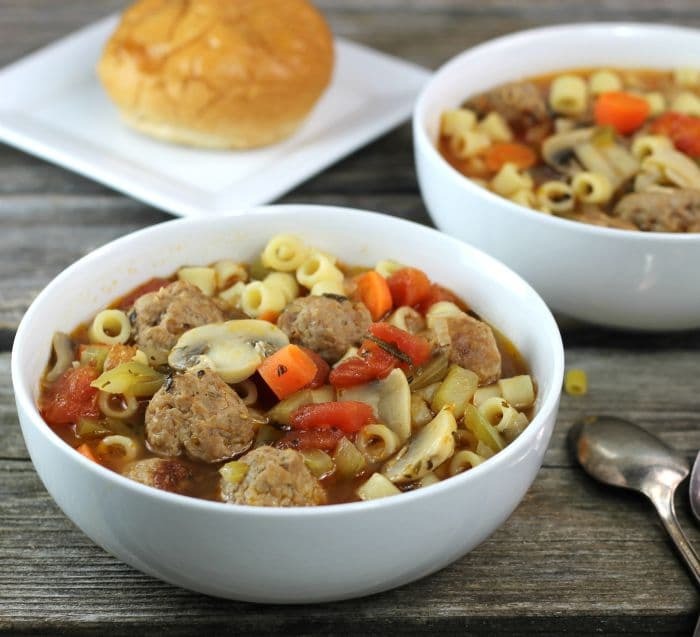 Italian meatball soup easy to make and soup that your whole family will love. This soup is perfect for lunch or dinner with a slice of crusty bread and a side salad. For me, soup is a must at this time of year. It’s my go-to comfort food when the wind is blowing and the temperature dips down. There is nothing more comforting than a hot bowl of soup. And in the winter you will find me making a big batch of soup almost every week. We went out to eat a while back and a cup of soup was an option for one of the sides with the dinner. The restaurant we were at had a few different soups to chose from. Italian meatball soup was one of the choices and since I had never eaten this type of soup before, I ordered it. I have to say that I really loved the soup. And since I loved the soup you know that I had to recreate it at home. I have a grocery store in my town that sells Italian sausage by bulk, it is some of the best Italian sausage that I have eaten. So I took the easy way on the meatballs and bought some of this sausage for the meatballs in this soup. 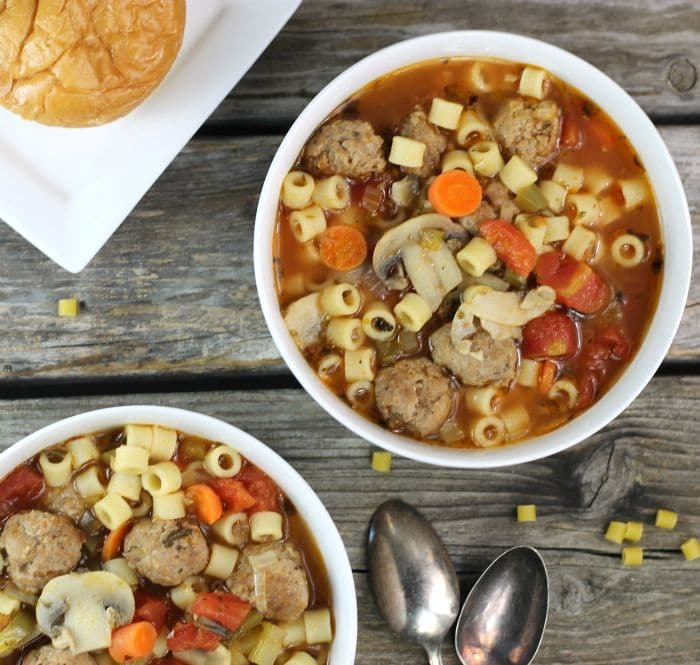 This Italian meatball soup is basically a vegetable soup with Italian herbs and Italian sausage meatballs, and pasta. I wanted a pasta that was small and the ditalini was a perfect choice. For the seasoning, I used basil, oregano, parsley, and bay leaf. These seasonings give the soup a bold Italian flavor. 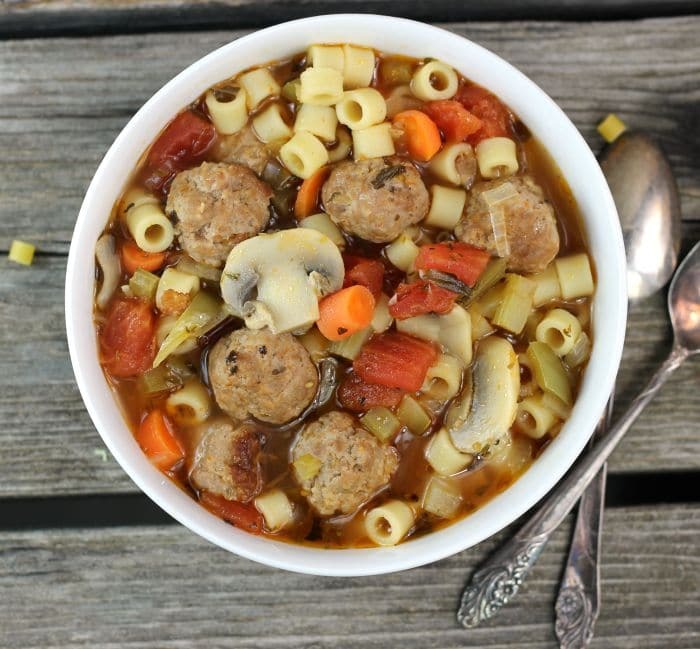 If you are looking for a soup that is full of flavor I hope you will try a bowl of Italian meatball soup. It will not disappoint you. In a large Dutch oven heat 2 tablespoon of olive oil. Make th Italian sausage into bite-size meatballs about a 3/4 to 1-inch balls. Cook meatballs in the Dutch oven until they are no longer pink inside. Time may vary depending on the size of the meatballs. Remove the meatballs from the Dutch oven and set aside. Drain any excess grease. Add the other tablespoon of olive oil to the Dutch oven and add the green pepper, onion, garlic, carrots, mushrooms, and celery. Cook for 5 to 8 minutes or until the vegetables are just about tender. Add the diced tomatoes, vegetable broth, parsley, oregano, basil, bay leaf, and pasta. Turn the heat up to medium-high and bring to a boil. Reduce heat to medium and continue to cook until the pasta and the vegetables are tender about 15 to 20 minutes. Season with salt and pepper. A wonderfully delicious and warming lunch! This looks absolutely delicious, Dawn! I’d describe that soup as a “hug in a bowl”…haha! 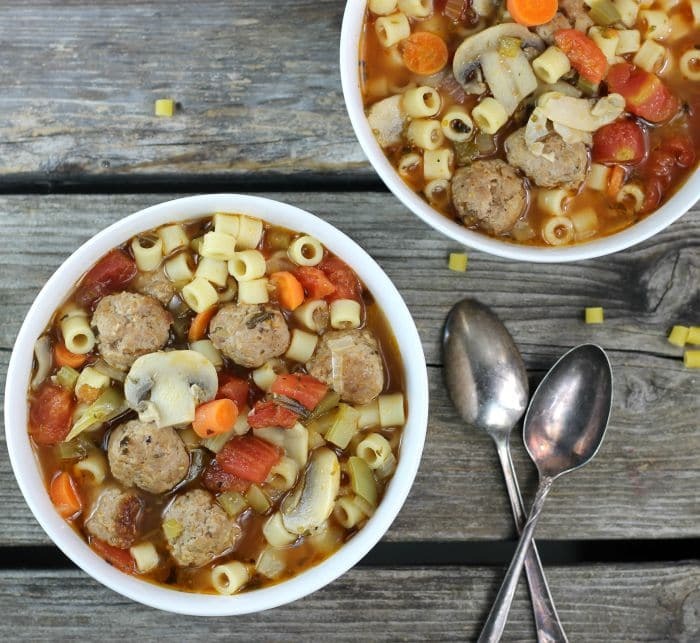 Laura absolutely loves Italian Meatball Soup, and I’m thinking it’s about time to make a big batch of this one here at home. Italian sausage really steps up the game here, and I’m thinking this would be perfect for the next big snowstorm…which I’m sure isn’t too far away! Thanks for sharing! I love that kind of pasta and I cannot find it here. What a great soup! Loaded with flavor, and looks wonderful, too. Thanks! I’ve never had this soup before either but it certainly does look and sound good. I have never tried a meatball soup but your recipe seems so intriguing. Plus in combination with pasta, it must be finger-licking. What kind of onion do you use for this soup? Hi Agness, I used a yellow onion in this soup. The soup is really tasty. I hope you try it! I could definitely go for this while we’re experiencing these sub-zero temperatures!